Tori Radnor has made an enemy. A deadly enemy. Tori runs a replacement service for homeless adults and teenagers. One of her main goals is to get her clients placed in Miller Markets located in the Poconos. After finally scoring a break by placing two clients in the market, her future is looking brighter and UpStart is off and running. Then all hell breaks loose. Someone is targeting she and her people causing serious damage. Aidian Miller, owner of Miller Markets, is facing a turning point in his life. His employees are being harassed, Tori’s office and car has been vandalized, his store is part of a well-established drug ring, his office manager has become unreliable. If that’s not of enough of a problem, the store is not producing a profit and living up to its potential. These are complications he doesn’t need. He just wants out. The villain’s taunts are escalating. Tori is afraid and fears for her life. Aidian isn’t sure if one of his employees is doing this or if his old stalker is back. Luke, Tori’s son, is missing and if she doesn’t come to the store, her enemy is going to kill him. Tori it’s trapped in the store’s meat section with a psycho determining to kill both she and Luke without a band saw. Will Aidian or anyone arrive in time to save them before it all becomes UNHINGED!!! Loved the book. Highly recommend it to readers that are looking for an intriguing well written story. 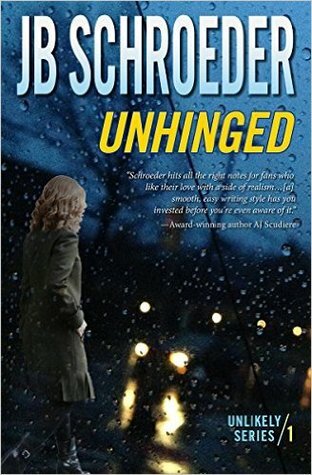 This is my first time reading Ms. Schroeder’s books, but looking forward to reading many more in the future.